Vacation starts out with an opening title sequence comprised of hilarious holiday snapshots that reveal themselves to be moments the participants would rather forget. Sadly, due to the fact that this film offers neither a decent journey, nor satisfying destination then the photos could well represent the audience after seeing the film. 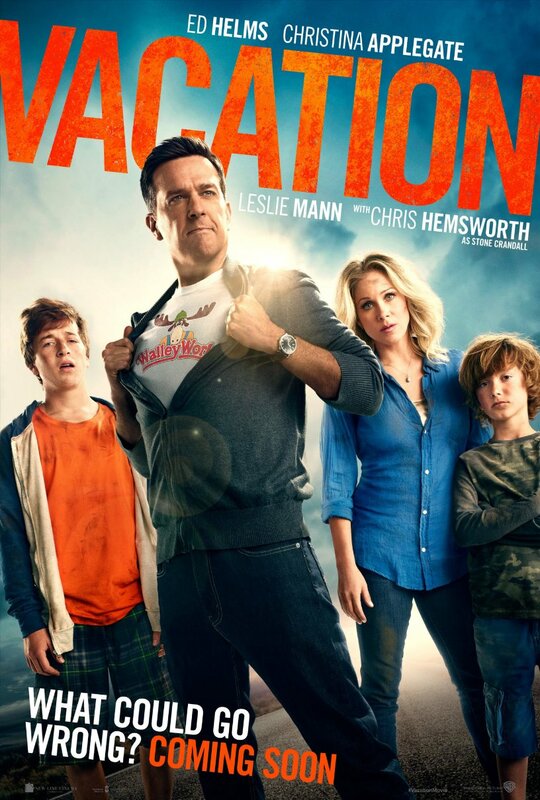 Attempting to reboot the hugely successful National Lampoons Family Vacation films from the 80’s, this seventh Vacation film pays homage to the original 1983 model, but with inconsequential results. The premise is simple enough – Rusty Griswald (Ed Helms) wants to spend more time with his wife Debbie (Christina Applegate) and two sons James and Kevin, so embarks on a cross country road trip from Chicago to California to visit the Disneyland rip-off WalleyWorld. on the way they encounter hilarious (or not) obstacles and discover that being a family is really cool. Borrowing riffs from not just those films, but also the likes of Talledega Nights and most recently 21 Jump St and We’re The Millers, it’s a mean spirited, road trip family comedy that doesn’t seem remotely appropriate for family audiences. There are some laughs to be had, but overall it’s a tiresome affair. One of the lines of dialogue spoken by lead Ed Helms (no comparison for Chevy Chase’s turn as the ambitious Dad in the original – who incidentally looks completely out of place and out of laughs when he makes a cameo late in the piece) rings particularly hollow – “I’ve never even heard of the original vacation. This one will stand on it’s own feet”. The filmmakers will presumably hope today’s audiences are not familiar with the original – a classic in the genre – and will find some amusement in this dull ride. One exception is the appearance of Chris Hemsworth and Leslie Mann as the family’s relatives who they visit en route to WalleyWorld. With the addition of these two characters the film lifts and it’s a shame there was a way to include more of this interplay to raise the remaining drab parts.